St. Michael's was founded in Otober of 1909. The parish was made up of immigrants from parts of Europe such as Austria-Hungary, Galicia and Russia. They sought work in the mining areas of Illinois and Missouri and a few settled in St. Louis. Our first meeting place was a home purchased at 1125 Hickory Street, which was converted into a temporary house of worship. Early in 1926 parishoners began raising funds for a church and ground was broaken for a new temple in 1927 located at 1901 Ann Ave at Gravois. The dedication of the new church building took place on June 2, 1929. St. Michael's architectural style is Byzantine cross and dome with coupolas. Many people traveling on Gravois stop to gaze and photograph the little Russian Haga Sophia that has become a prominant land mark in St. Louis. Life as an Orthodox Christian Community has continued to the present. 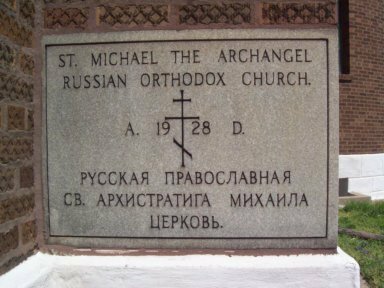 While the parish has a stellar Russian heritage, our mission and vision is to embrace all who wish to partake of the fullness of Orthodox faith. Our current membership includes ethnic Russians and English speaking Americans, cradle Orthodox and converts. All are welcome in the mystical body of Christ. Services at St. Michael are in the English language an ar celebrated on the new (Revised Julian) calandar. Sunday Mornings: The Third and Sixth Hour are read at 9:00 AM, During the Lenten and Paschal Season the Mattins Canon is sung at 8:45 AM. Divine Liturgy is at 9:30 AM. Sunday's 4:30 to 5:30 PM on the first, second, and third Sundays of the month, FOCUS Sunday Suppers.